Fly Tackle - 3wt Rod Thru 14wt Rod Available in Left Hand Retrieve or Right Hand Retrieve or Both. If you are looking for a qualified guide to take you on a trip of the lower portions of the Florida Keys then look no further. Captain Lindsay Harper can do this for you. As an experienced charter captain, especially in the flats and shallow water areas, Captain Lindsay is more than willing to share his knowledge in order to make your fishing trip a success. You can enjoy fly-fishing or light tackle fishing in the waters surrounding the Marquesas Keys. In this area, you can capture the mammoth Bonefish, the elusive Permit, or the terrifying Shark. Of course, these are just a few of the many different types of fish you can catch with Captain Lindsay as your guide. One of the types of fishing you can do on your trip with Captain Lindsay is sight casting. Sight casting is exciting because as you fish, you have the ability to see exactly what you can catch in the crystal blue waters. The waters are so clear and sparkling that you can chose a specific target and cast away! All of the fish swimming in the flats will be visible, so even if you do not plan to fish in this area, the view is amazing! Captain Lindsay’s boat, The Miss Inclined is what you will travel on during your fishing expedition. The 17’ Maverick Mirage HP is quite the sight to see! On The Miss Inclined, you can travel across the Keys to various locations to your chosen fishing destination. Depending on the weather, you may be traveling to one or more of the various locations in Key West that Captain Lindsay knows quite well. 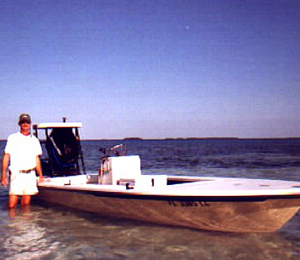 You will find that the Captain is incredibly knowledgeable about the waters surrounding Key West. This is because Captain Lindsay has been sailing the seas in the area since the late 1980’s. Before coming to Key West, Captain Lindsay started out as a Captain in the Caribbean. Captain Lindsay is a hard working charter captain and it shows. Her work ethic and knowledge are part of what keep anglers coming back to him for all of their Key West fishing needs. He is fair to everyone treating each trip as the same amazing experience it is. Her excitement and enthusiasm is contagious and he is more than willing to help you out with anything you need during this entire expedition. Captain Lindsay is patient, entertaining, and courteous. If you are new to fishing, you will find that his gentle guidance is more than enough to lead you to the perfect catch. As a seasoned professional, you will find the companionship worthwhile when you travel with Captain Lindsay. If you plan to book a charter with Captain Lindsay on The Miss Inclined, do not worry about what you need to bring with you. Captain Lindsay takes care of that for you. Any licenses that are needed for your trip are purchased for you. Additionally, Captain Lindsay provides, ice, coolers, and tackle, so you can catch fish and then store them until you get to shore. Expect the best equipment on the market when you travel with Captain Lindsay and her crew. In fact, the fly fishing tackle is considered some of the best tackle available. The fly gear is also provided by excellent fishing supply companies such as Sage, 3M Scientific, Loop, Able Reels, Scott Rods, and Angler Fly Lines. Spin and bait tackle, which is also provided on your fishing trip with Captain Lindsay is available from companies like Abu Garcia, Falcon Rods, Fenwick, Shimano, and Berkley Trilene. Additional gear comes from Action Optics, Ex-Officio, Julbo, and Patagonia. I have been to the Bahamas many times, but The Miss Inclined is one of my favorite trips! It includes everything that everyone should do here. As a Bahamas veteran, I can say only the best about this experience!